A refined color palette featuring exciting options to achieve the look you desire. This offering boasts more vibrant colors that give the finished product additional visual depth and resistance to fading. 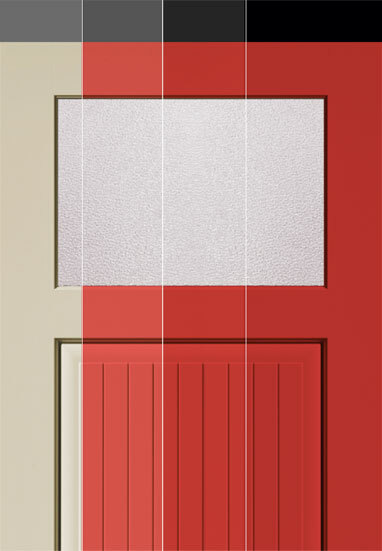 The same elegant paint color on the frame as well - In addition to finishing the door, Reeb® Finish will paint On-Guard™ composite or solid wood frames for a complete pre-finished door unit. Each door is carefully inspected and prepared for the painting process prior to entering the coating area. All components are wiped clean, glass is taped-off and edges are prepared to ensure proper base-coat application. The preliminary top coat seals the finish and enhances the color applied during the painting process, adding durability and sheen to the final product. The third and final coating further accentuates the unique beauty of the finished product and is essential to provide maximum durability and protection from the elements. Reeb® Finish Paint colors are Trade-Matched to Reeb Finish Aluminum Clad and Larson® Storm Door colors. What does Trade-Matched mean? Each paint color is applied to a different substrate and the end results are colors that are similar in appearance but not exact matches. Please view the color comparison chart to see which colors are trade-matched to each other. Aluminum Clad is a pre-painted finishing solution for jambs and brickmould which adds an attractive, clean look to your overall door unit. Designed from an affordable aluminum coil stock, Aluminum Clad is formed into a protective covering with highly defined molding details and a textured, easy-to-clean surface.